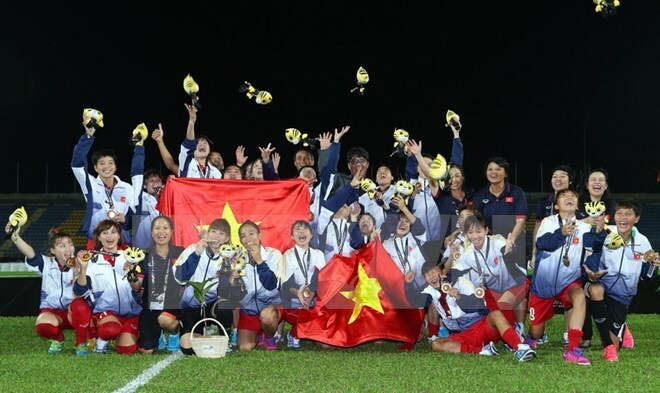 Hanoi (VNA) - Vietnam won the title in the women’s football at the 29th Southeast Asian Games (SEA Games 29) after defeating the hosts Malaysia 6-0 in the last match on August 24. With this win, Vietnam notched up 10 points, drawing level with Thailand who beat the Philippines 3-1. However, Vietnam took the lead on goal difference. Vietnam’s six goals were scored by Nguyen Thi Muon and Nguyen Thi Lieu (two goals each), Vu Thi Nhung and Huynh Nhu. This is the fifth time Vietnam women have triumphed in the largest regional sport event, equal to Thailand’s achievement. The team dominated the match from the start. Nhung opened the score for Vietnam in the seventh minute. Six minutes later, Vietnam doubled the score following a long shot by midfielder Lieu. In the 21st minute, goal keeper Asma Junaidi deflected a shot to maintain her team’s lead. After quick attacks, Vietnam scored their third goal thanks to midfielder Muon in the 40th minute. In the final seconds of the first half, from a corner kick, Nhu raised the score to 4-0 for Vietnam. After the break, the visitors kept control of the match. After many continuous attacks, Muon scored one more goal for her squad. In the 79th minute, Lieu completed the scoring at 6-0 for her team. At this year’s SEA Games, five women’s football teams, including the hosts Malaysia, the Philippines, Thailand, Myanmar and Vietnam played in a round-robin format. Meanwhile, Vietnam’s U22 men team was knocked out of SEA Games 29, prompting Nguyen Huu Thang to announce his resignation as head coach. Vietnam lost 0-3 to Thailand in the last Group B match while Indonesia beat Cambodia 2-0.